To implement the reservation policy for SCs/STs in the Universities and Colleges. To collect data regarding the implementation of the policies in respect of admissions, appointments to teaching and non-teaching positions in the universities, and in the affiliating colleges and analyse the data showing the trends and changes towards fulfilling the required quota. To implement, monitor and evaluate continuously the reservation policy in universities and colleges and plan measures for ensuring effective implementation of the policy and programme of the Government of India. The University Grants Commission (UGC) has given priority to the downtrodden students and staffs during IX plan period and given direction to all the universities to establish SC/ST Cell. 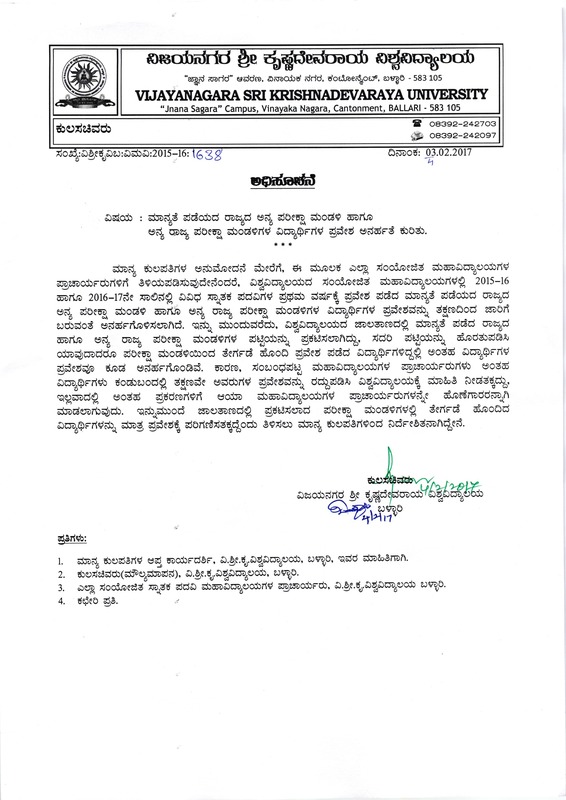 The SC/ST Cell at Vijayanagara Sri Krishnadevaraya University Ballari was constituted in the year 2012. After the establishment of the Cell in the university, it specifically concentrated on the welfare of the SC/ST students and staffs. The main aim of the Cell is to monitor the guidelines issued by the MHRD, the University Grants Commission and by the government of Karnataka from time to time. The Cell ensures the effective implementation of the reservation policies in the university admissions to students in various courses of studies, accommodation in the hostels, appointments to the teaching and non-teaching posts, and allotment of quarters, establishment of Book Bank in the university, and maintenance of roster register in the University. Post Graduate Ladies Hostel has been started in the premises of the University for providing food and free accommodation. 111 Post Graduate Students and 03 Ph D Scholars are the beneficiaries of this Hostel. Advance Amount is giving for both Boys and Girls Hostels for their Mess purpose. 217 Boys, 111 Girls, 27 Male Ph D Scholars are obtaining this benefit. Students grievances meeting is being organised by the SC/ST Special Cell under the Chairmanship of Hon’ble Vice Chancellor. Several issues of the students have been solved on the spot directions and solutions find out by the Hon’ble Vice Chancellor. Spoken English and Soft Skill Training Programmes was organised for SC/ST Boys Hostellers to enrich themselves. By understanding the monitory difficulties faced by the Research Scholars, The SC/ST Special Cell is providing fellowship program Rs. 8000/- per month under SCP/TSP Scheme. The cell also giving 15,000.00 Annual Contingency for Ph D Scholars for the Period of Three Years. Provided Lap Top to 50 Ph D SC/ST Research Scholars to meet their academic expectations. Baba Saheb Dr. B.R. Ambedkar Multi Disciplinary Research Centre is organising series of Programmes on the occasion of Baba Saheb Dr. B.R. Ambedkar’s 125th Birth Anniversary (Separate Report is given through the centre) Celebration Programme. The SC/ST Special Cell is supporting this Centre. Ten Days National Level Workshop on Research Methodology was organised between 05th April 2017 to 14th April 2017 in association with Dr. Babu Jag jeevan Ram Study and Research Centre and Baba Saheb Dr. B.R. Ambedkar Multi Disciplinary Research Centre. TA/DA and Registration will be providing to the students those who participate in the National and International level conference/workshop/ seminars. SC/ST Special Sub Cells are opened in the Post-Graduate Centre, Nandihalli and Koppal to function for the wellbeing of the SC/ST Students and Employees. Guidelines that include directives of UGC/State/Central Government etc.